The following article was discovered in the Nottingham Evening Post 7th April 1916 and adds another dimension to local events in the years of the Great War. ‘The members of the North Midland Library Association visited Mansfield, where an interesting conference on” The War and Its Effect on Public Libraries” was held. The president (Mr Samuel Smith, Sheffield) took the chair, supported by Mr R W Brown, vice-president, Northampton, and Miss Pierce, ex-president, Kettering. Ald. Wallis, chairman of the Mansfield Library Committee, welcomed the conference. To Mr J P Briscoe (Nottingham), who was unable to attend owing to ill health, a message of sympathy and good wishes was accorded, proposed by Councillor Ball, of Mansfield. Mr Briscoe had done much for the Mansfield Library, which he opened in 1891, and his services in the library movement was everywhere appreciated. In th “War Conference” which followed experiences regarding the effects of the present crisis in their respective towns were contributed by librarians from Yorkshire, Northants, Lincolnshire, Nottinghamshire and Staffordshire. The various representatives referred to the special efforts libraries had made and were making to cater in everyway possible for present day requirements by the addition of special works on military science, new industries, language, and books dealing with the countries engaged in the war. At a period in which so many educational institutions were closed, libraries were specially valuable. The hon. secretary (Mr W A Briscoe, Nottingham) referred to the literature on the war, concluding by saying that public libraries served not only a local need, but rendered a national service. 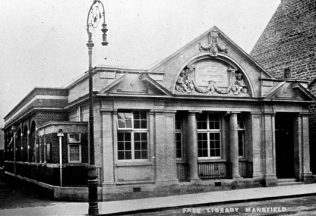 1891 28 October The Mansfield Free Public Reading Room and Library, in the Corn Exchange, Mansfield Town Hall, was officially opened by Mr. John Potter Briscoe, Librarian of the Nottingham Free Libraries. 1905 24 May The Mansfield Free Library, Leeming Street, was officially opened by the Mayor, Mr. George Hudson Hibbert (1842-1905). 1977 23 March The old public library, Leeming Street, was closed. See also the page on the Carnegie Library under Mansfield.